Corsair has introduced the Vengeance Gaming PC, the second addition to its pre-built computer line up following the Corsair One. The Vengeance Gaming PC is a larger Micro ATX system compared to the Corsair One, but it’ll be easier to upgrade as it uses only standard PC components. Unsurprisingly the Vengeance Gaming PC’s specs listed below include the brand’s own PC case, CPU liquid-cooler, memory and power supply. Overall, you’re looking at a very solid and modern gaming PC. While we would have preferred to see an Intel 9th Generation Coffee Lake Refresh processor, these CPUs basically hit the market just a little more than three weeks ago. 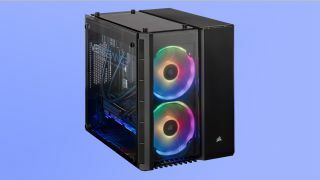 RGB diehards will also like the Corsair iCUE software, as its one of the only programs that manages to wrangle lighting control both inside and outside the PC case. Users can also dive into the iCUE software to monitor and control their systems cooling and memory speed, to name a few parameters. Corsair tells us that this will be the only configuration available at launch today, and it will set you back a hot $2,399 (about £1,840, AU$3,325). That’s not too bad of a price considering the modern specs of this machine, an included two-year warranty, K55 RGB gaming keyboard and Harpoon RGB gaming mouse. You can be sure we'll be one of the first to review the Corsair Vengeance Gaming PC, so stay tuned for our testing and final verdict on this diminutive beast.